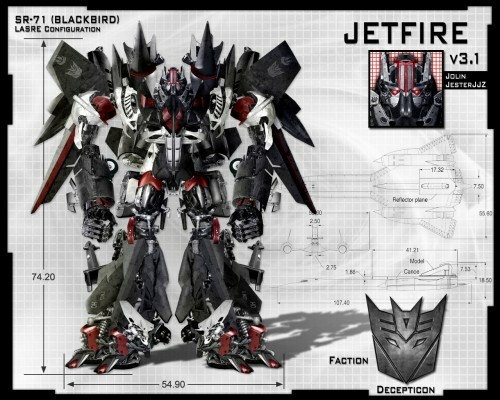 credits to this fanmade concept Jetfire for TF2, you got my vote =).. Jetfire (Revenge of the Fallen) as an old fart just doesn\’t suite me..
You’d think the robot would be too black for khausereich88’s taste. I couldn’t keep track of who was who in that movie. Tons of bots, tons of people; not very well done. Um, as I recall it, Jetfire was actually an Autobot, and the original toy model was a direct copy of the Macross/Robotech VF-1S Veritech fighter – down to the UNSpacy logo on the leg. wait, this doesn’t SUITE you? as in a luxury suite at a hotel? i believe the term you’re looking for is “doesn’t suit”. christ.